I haven’t been blogging much recently because I haven’t had much to say for myself. I know that I’m a loud, sweary, sweaty man but sometimes it’s good to stay still, sit down and shut up when you have nothing much to say. The product of swearing and sweating is seldom worth reading on their own. I had to write off Manchester Marathon in early April because I was really poorly the week before. I passed out on the sofa at home. That was a novel experience. Normally when I collapse it’s done with some spectacle, most notably on the altar at Mass one Sunday morning when I conked out just after the consecration of the host and sent the altar bell skittering and ringing across the floor. More recently, I managed to lock myself in the loo, throw up, pass out and cack myself all in the space of about thirty seconds. On neither occasion had drink been taken. I’ve had a really enjoyable weekend of racing this weekend though. It’s made me think about fun: what it is, where it comes from and why running around like lunatics on a hot day can be considered a fun thing to do. The first round of Hot, Hilly and Horrible was the BMAF Road Relays in Sutton Park yesterday. I had an early start made tolerable by the company of a carload of attractive women. There’s nothing quite like the prospect of pulchritude to get one out of the door before seven o’clock on a Saturday morning. I picked up a coffee first because I’m an idiot and I ran out of coffee on Friday, then Maria, Nicky and Lynn before heading off along the A14 listening to the ladies make connections. It’s fascinating. They talked about children and work and each of them had different people in common. They wove a web of acquaintance in a way that men just don’t do. The ladies’ race was at 11:00am and we arrived at 9:30am. Bitter experience has left me as mistrustful of the A14 as I am of an unfamiliar dog. You never really know whether you’re going to run past it unscathed or not. Yesterday was fine. We had plenty of time to settle in, have more of a chat, a bite to eat and something to drink before they set off on their warm up. It wasn’t a long one because the day was already heating up. Nicky took the first leg and stormed round the 3 mile course. I sorted myself out while she was running, getting changed into my race kit and shoes, taping up my sore Achilles tendons and all that palaver. The rest of the men’s team arrived just as Maria set off on the second leg. She ran strongly too and Lynn was gone before I really had time to think about things. Each leg has an uphill finish and I waited towards the bottom of the hill to see Maria and Lynn in. They both flew up that hill looking strong and fresh. In the end, they had a great race finishing 9th out of 23 teams. The boys didn’t quite fare so well. We set off at 1:00pm and Simon ran his leg much more quickly than I thought he would. I was next to go and wasn’t quite ready for him. A bit like the handover from Christof in the Round Norfolk Relay last year, I looked up and there was Simon powering over the line. I had to barge my way out of the holding pen and set off. My deep apologies to anyone I stood on or elbowed getting away. There is a brief, blissful downslope to begin the lap, just enough to get your legs turning over, before the major climb on the course. I was being overtaken by younger men which was fair enough, men in my own age category which hurt a bit because I was really trying and finally by much older men and that was painful. The standard in this race was much higher than in any of the local races I’ve done recently. I must be getting complacent. I’ve become used to running hard and finishing in the top third or even the top quarter of the field. I ran my heart, lungs and legs to overheated, bloody pulp yesterday only to serve as the next target for some speeding, strong, freak of nature behind me to come screaming past. If I hadn’t been suffering so much I would have found it very impressive. I lost sixteen places in my own race, and countless others to the other categories. I didn’t overtake a soul. At one point, a runner from Trentham came past on a downhill stretch and I tried to stay with him. I managed for about 100 yards. It felt like a 100 years. The weather was hot, the course was hillier than we usually get round the Fens and I’m a wimp so it was never going to end well. Had I been racing for myself, there were times I would have walked. Knowing that Ian was waiting to set off kept me running even as the next bloke blew my doors off. That last climb couldn’t come soon enough, it really couldn’t. I bustled over the line in 21:26 feeling very ill indeed. I couldn’t breathe, could barely walk, the sun was relentless and a big Brummie was trying to keep me moving through the funnel. I really hope I didn’t swear at him. The marshals and other volunteers were brilliant if a little thin on the ground. Ian was back before I had finished stretching and Andrew smashed the course and himself. We finished in 1:20:00 after Ian had made up four places and Andrew a simply magnificent 23 places. Andrew was running on a dodgy ankle too so his truly was the Glory Leg. So, the course was horrible, the weather was disgusting, I was humiliated by some sprightly but elderly men and yet I had fun. I had lots and lots of fun. I was out running with and for my mates and when I got back and had stopped wanting to throw up, I had sausage rolls and very nice cake and the company of some remarkably generous and supportive friends and I loved the entire experience. Today’s Wimpole 10k Hoohaah was even harder than yesterday’s race and I wasn’t even racing it. It became Hot, Hilly and Horrible Part 2, The Wrath of Cramp. I love the Wimpole Estate, love it to bits. I spend a big chunk of most Saturdays there for parkrun and sometimes I go back on Sundays for a long run. 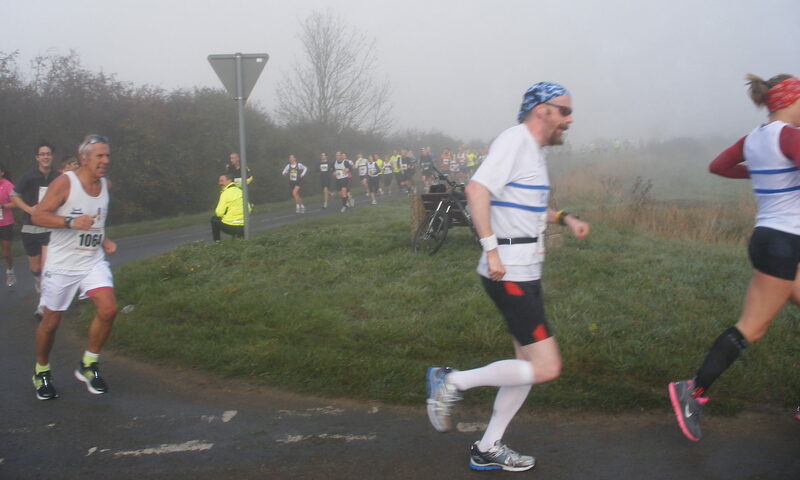 It’s hilly for Cambridgeshire and the trails can be ankle-deep in mud during the winter. The 10k course starts on the flat and then you’re climbing from about 1.5k to about 4k on narrow, rutted farm tracks and field margins. It’s not easy underfoot but the views when you look up from the ground six feet in front of you are lovely. The rest of the course undulates through woodland where the tracks are wider and drier. There is a final climb from 6 to 6.5k when you just want to find a kindly forester to take his axe to the back of your neck and put you out of your, his and everyone else’s misery in a 20 mile radius. I stopped at the water station to get a drink inside me and again at the Top of the Hill at 7k to help a BRJ clubmate who was having hamstring problems. Richard and I jogged in once he’d stretched out his hammie. I crossed the line high-fiving Alison from Hoohah in a near PW of 51:56. There is something about racing at Wimpole and about the Hoohaah atmosphere, I just feel at home there. I suppose it is my second home. This was still fun. The run was hard work over challenging terrain on another hot day. The course rose and fell like a soap star’s reputation and the weather was more suitable for a garden party than a race but I had an absolute ball. This race was similar to last autumn’s Half Marathon Hoohaah there. I had a shocker there because of an injury but the race was still one of my favourites of the year because I saw so many mates running around. Friends make for fun times and that’s what I had this weekend.